During a brief trip home in-between the Big Bash League in Australia and the start of the Indian Premier League (IPL) Jofra met up with Danny - who himself has recently returned from his second England Lions tour of the winter – and dropped into the regular Tuesday afternoon session at Southwick Leisure Centre on the outskirts of Brighton. The pair joined 17 local boys and girls for a game of the fast-paced version of cricket that is played outside of traditional club settings with a tapeball – a tennis-ball wrapped in electrical tape – and is designed to break down barriers like cost, equipment and accessibility that can be associated with sport. Captains for the day, 12-year-old Rhys and 13-year-old Taylor picked the teams, with the two newest participants at the session ending up on opposite sides. Watch the video of the afternoon to see who came out on top above: Team Rhys featuring global T20 superstar, Jofra Archer or Team Taylor, featuring England spinner, Danny Briggs. 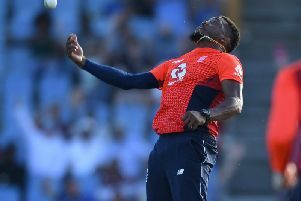 Speaking after his first taste of Chance to Shine Street Cricket, that came just days before his much talked-about qualification for England, Jofra said: “Speaking to the coaches, I found out that a lot of the kids here are not in clubs, which I found hard to believe because there’s so much talent. “I guess some kids might not have the means to go to training or to afford cricket kit. Street Cricket means they don’t have to worry about that, they can just come and play. Danny, who has played eight limited-overs internationals for the full England side, added: “It’s so encouraging to see the numbers coming down here and participating in cricket. It’s great for the kids to be able to just come and play. It’s relaxed, you face balls, you bowl balls, you get to field. 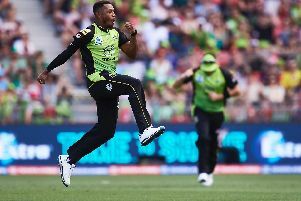 “When I was young, there wasn’t anything like this and it was much harder to get involved if you weren’t from a cricketing family or if you didn’t live near a club. Street Cricket means these kids can give the game a go. There are currently 165 Chance to Shine Street programmes taking place across the country. Chance to Shine is a national charity that aims to help children and young people play, learn and develop through cricket. SCF is running seven of these programmes for 8-14 year olds in Sussex. The venues for these are Willingdon Trees Community Centre in Crawley, The Y Centre in Hastings, Southfields Jubilee Centre in Littlehampton, Southwick Leisure Centre, The Crew Club and Manor Gym, both in Whitehawk. Sessions are completely free; no equipment is required and participants can just drop-in. To find out timings for each session or for more information on SCF’s Street Cricket project, visit www.sussexcricket.co.uk/chance-shine-street.